← 10% Off of Your First Order! Try the Meal Delivery Service! 1) Adjust the oven rack to the middle position. Preheat oven to 375 degrees F.
2) Lemon Filling: Whisk egg yolks in medium size mixing bowl and set aside.In a medium saucepan, combine cornstarch, water, sugar, and salt. Whisk to combine. 3) Turn heat on medium and, stirring frequently, bring mixture to a boil. Boil for 1 minute. Remove from heat and gradually, 1 whisk-full at a time, add hot mixture to egg yolks and stir until you have added at least half of the mixture. 4) Return egg mixture to saucepan, turn heat down to low and cook, stirring constantly, for 1 more minute. Remove from heat and gently stir in butter, lemon juice, and zest until well combined. 5) Meringue Topping: Place egg whites and cream of tartar in the bowl of a stand mixer fitted with the whisk attachment. Beat egg whites until soft peaks form and then gradually add sugar and continue beating until stiff peaks form, approximately 1 to 2 minutes. 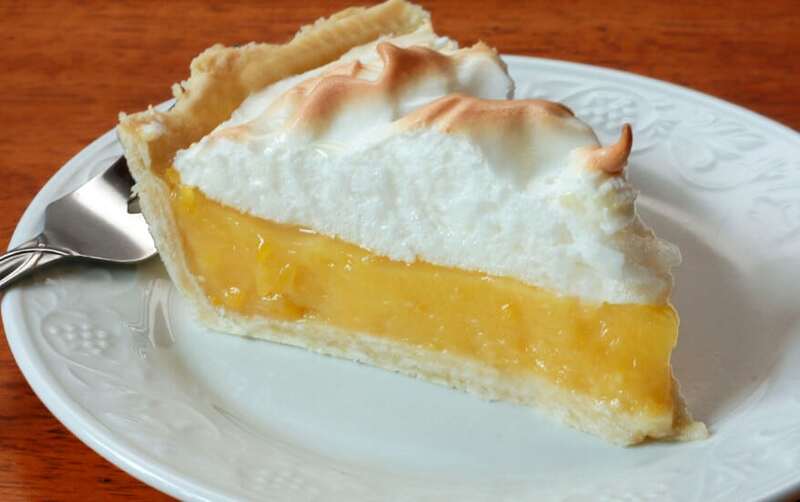 6) Pour mixture into pie shell and top with meringue while filling is still hot. Make sure meringue completely covers filling and that it goes right up to the edge of the crust. Bake for 10 to 12 minutes or until meringue is golden. Remove from oven and cool on a wire rack. Make sure pie is cooled completely before slicing.